The electronic smoking devices, also known as e-cigarette has started a new trend among teenagers in Singapore, gaining it’s popularity of its ease to access and without the need to undergo checks for legal age requirements. These e-cigarettes or vaporisers an e-liquids can be purchased from online marketplace like Carousell, Gumtree and Qoo10, as well as social media like Instagram and Singapore-based online forums. On Carousell, there are as much as 30 such posts selling e-liquids under vague search terms like”juice”. E-liquid refills are sold for about $13 Singapore dollars for a 10ml bottle and $25 Singapore dollars for a 30ml bottle. It comes with different flavours such as bandung, root beer float and caramel macchiato which maybe laced with nicotine. Singapore government has banned the use or importation of these electronic cigarettes, cigars and pipes. While according to the Health Sciences Authority (HSA), there were more than 15,000 cases involving people bringing vaporisers into Singapore illegally between 2012 and September 2015. In the same period, 39 peddlers were caught for selling vaporisers in Singapore.HSA said the vaporisers were found in parcels, most purchased online and on people caught hand carrying into Singapore. What is the Fines / Penalties ? The Tobacco (Control of Advertisements and Sale) Act in Singapore prohibits the importation, distribution, sale or offer for sales of any item designed to resemble a tobacco product, including vaporisers. Thus, buying these vaporisers or e-cigarettes from overseas websites or hand carrying in hand luggage is also considered as importing. Offenders may be fined up to S$5,000 for the first offence and up to S$10,000 for subsequent offences. Though the invention of the vaporisers were to aid smokers from getting a puff out of a cigarette, but there are concerns raised on the reliability and usability of these electronic devices. Dr Wong Seng Weng, medical director of The Cancer Centre, said these e-cigarettes users are exposed to nicotine, which is addictive, as well as heated and aerosolised propylene glycol and glycerol, which may turn into carcinogens. Carcinogen is a substance that has cancer-causing agents and toxicants, in same cases, as much as those in conventional cigarettes. In addition, there are also cases that e-cigarette explodes and caused bodily injury to the users. You may want to check out the man in Kentucky, US that suffered second-degree burns after his faulty e-cigarette set his trousers on fire. After all, there are still no in-depth studies that e-cigarette could be as smoking-cessation aids and the industry safety standards for manufacturing such devices are not being laid out and widely accepted by countries. Quitting Smoking Once and For All ? If you are looking at some help for quit smoking, you may join the iQuit Club in Singapore. Man catches fire after e-cigarette explodes in his pocket at petrol station, The Guardian, 26 February 2016. Retrieved 2016-02-29. US health watchdog to take legal action against e-cigarette makerse, The Guardian, 2 September 2015. Retrieved 2016-02-29. This is one of the signs which are being displayed outside a pub in Suntec City. Don’t take it as just a warning because I have heard of coffeeshop owners being fined thousands of dollars just because they failed to check their customer’s identity card and got caught. While the cost of cigarettes in Singapore has been soaring over the years, most of the Singaporeans has make use of overseas trip or a trip to Johor Bahru to bring back some non-duty paid cigarettes into Singapore for consumption. Beware, however, it was an dangerous act as these smokers are not aware of the strict law in Singapore. Trying to bring in more than one packet of cigarettes (which must be an open pack) through the Singapore customs constitute a fine penalty, either you have landed at Singapore’s Changi Airport or returning from the Causeway Link from Malaysia. In the past, the law passed was not applicable to foreigners who had the privilege to bring in 400 sticks of cigarettes, approximately 20 packets, without getting a fine. This was quite a normal rule among Asian countries. Unfortunately, there has been a recent change, and now even foreigners have to adhere to the same rules as Singaporeans – the allowance of just one open pack of cigarettes. One of my Japanese friends came over to Singapore last month and he brought 3 packets of cigarettes with him. He failed to declare while going through the customs since he thought the quantity was too small to violate the law. He ended up paying S$400 for the other 2 packets of cigarettes. Be careful of you are bringing in cigarettes. Even you are lucky with the customs, you can still be caught for violating the law if your cigarettes do not have health warnings signs or SDPC markings. There will be fine of up to $200 per packet of cigarettes or per 20 sticks of cigarettes. 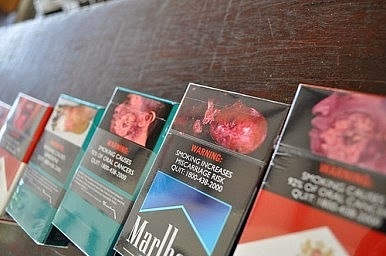 In order to pass down messages to smokers that smoking is bad for health, the Singapore government passed down a new law on tobacco sales in July 2004. All cigarette package needs to have health warning labels as shown above (One of the example) if to be Since July 2004, Singapore has implemented a new policy on cigarettes sales. Implementation of this labels also stopped cheaper cigarettes smuggled from neighboring countries like Malaysia and Indonesia, but it did not last long as imitation versions came soon after. Just recently, the Malaysia government has also declared that cigarette package need to have health warning labels as well. 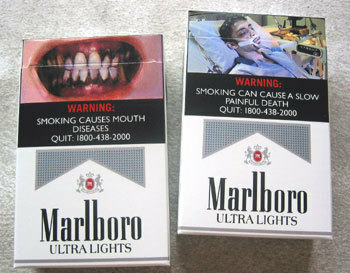 Singapore started the implementation of the health warnings on cigarette boxes since July 2004. The warnings are required to cover 50% of the front and 50% of the back of all packages. In 2003, a set of six warnings were rotated on cigarette packages and in 2006, a new set of 6 warnings were put in place. A third set of picture warnings for smoke tobacco products have been proposed, and are expected on packs in 2013. 1. 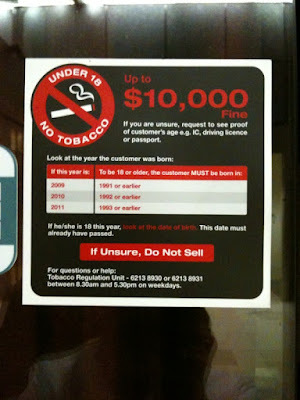 Tobacco Labeling Resource Centre, Singapore. Retrieved 2016-02-28. This article was updated on 28 February 2016.